How will new business models will disrupt our industry? How do we innovate to create the next big growth opportunity? What business strategies will get us to, and keep us on the top? 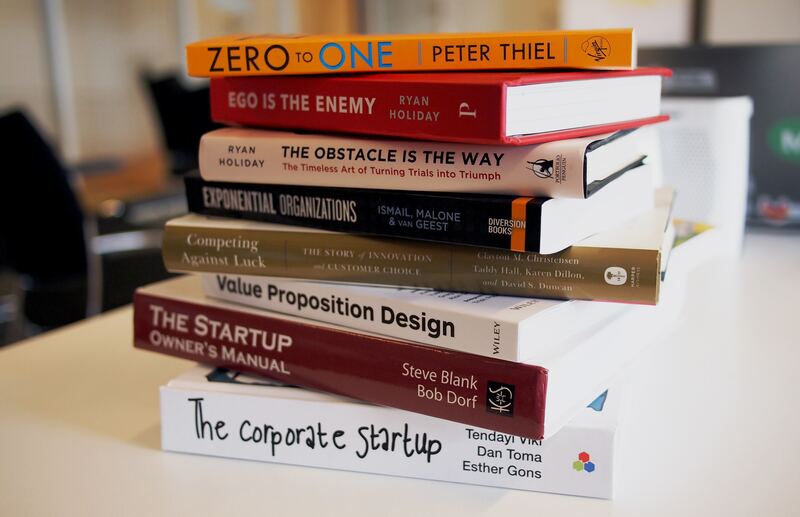 I’m constantly on the lookout for new books and resources on the topic of business strategy. And there’s a big trend when it comes to business strategy development – more and more, the topics of business strategy and business model innovation are merging. Sometimes knowing when you need to shift directions in a business is one of the hardest things for a leader to do. Reinvent Your Business Model is Mark Johnson’s new book on business model transformation and innovation. Johnson is the co-founder of Innosight, an innovation and strategy consulting firm which he founded with Harvard Business School professor Clayton M. Christensen. In this book, Johnson provides a practical framework for unpacking how business models actually work and provides rich case studies of businesses that have achieved great success by shifting their models. Highly recommended for leaders that want to determine if and when their organization needs a new business model. Topple is a new book by Ralph Welborn and Sajan Pillai with a powerful thesis, that the new competitive landscape in business will be determined less by company-specific strategies and more by entire business ecosystems. Welborn is CEO of CapImpact, a management consultancy based in Boston. Pillai is CEO at UST Global, a digital technology services company with over 15,000 employees. Together, Welborn and Pillai have put together a book which seeks to help organizations understand what business ecosystems are and how to leverage the power of these ecosystems to capture new value. Strategy Beyond the Hockey Stick by Bradley, Hirt and Smit takes an irreverent, fact-based look at the phenomenon of strategic decision making. The three authors come from McKinsey’s Strategy Practice and have worked together for a decade to advance the science and practicality of strategic management for some of the world’s largest corporations. In this book, Bradley, Hirt and Smit look for ways to help leaders beat the odds and break through the inertia of slowing growth the achieve success and build bigger and bolder strategies. One of the biggest fears that companies face today is that of increasing competition. There is a constant threat of businesses being copied, and for having their products produced more cheaply and quickly. In Leap, Howard Yu, a professor of management and innovation at IMD business school in Switzerland, provides insights into what businesses can do to break away from the constant struggle of competition. In the book, Yu asks what leaders can do and what they can learn from companies that have struggled through competition and managed to thrive despite the copycats. Business strategy in the digital age requires an approach to digital transformation. With this in mind, businesses need to know how to develop strategies to innovate around digital. Enter Lindsay Herbert. In her book Digital Transformation, Herbert draws on her experiences leading change and innovation programs globally for IBM to guide readers on a journey to answer questions related to end-to-end execution of digital transformation. If you’re looking for a clear ‘how-to’ guide for digital transformation from leadership-level strategy development to on-the-ground implementation, look no further than this book. Agile management has become a business buzz word in recent years, but that’s not to say the methodologies that make up agile are overused. Digital Transformation to the Agile Enterprise is a holistic view of how agile thinking frameworks have impacted operating models, shifted business capabilities, converted value streams and completely upturned organizational structures. In this book, Golebiewski shares his experiences and lessons learned during digital transformation engagements he has had working as a consultant to C-suite executives in many Fortune 100 companies. If you want an interesting perspective on the future of the “agile enterprise,” check out this book. Does your business struggle to plan more than 6 to 18 months into the future? Do you have a long-term plan for your organization? Every year, the average lifespan for companies decreases, yet some companies still manage to push through and succeed in the long run. Go Long was inspired by sessions from the CEO Academy, an annual off-the-record gathering of CEOs organized by the authors. In the book, we are taken behind the scenes to see the business decisions that allow leading organizations to beat out the competition and develop long term strategic goals for themselves to succeed and thrive. The main point is clear, having a short-term mindset might satisfy investors or management, but there’s a heavy price to pay if you don’t create a business strategy with long-term thinking in mind. The subscription model business is rapidly becoming a favorite among high tech start ups and multinational corporations. Subscribed, by Tien Tzuo and Gabe Weisert, provides a brief history of how the subscription economy has taken off in recent years with the rapid growth of businesses like Netflix, Spotify, and Salesforce, and describes how this growth is only just beginning. Tzuo is the founder of Zuora, a leading subscription Software as a Service (SaaS) provider with over 1,000 customers worldwide. Gabe Weisert is the managing editor of Zuora’s Subscribed magazine. Have you ever wondered why some partnerships and teams break down, and why others succeed despite all odds? In his new book Dream Teams, entrepreneur and journalist Shane Snow goes over the counterintuitive reasons why some teams thrive and others die on the vine, and how you can avoid the pitfalls associated with dysfunctional team behavior. Snow, founder of marketing company Contently, gives us insights into why some of the world’s largest companies have failed while other arguably less organized groups have succeeded. Expectations are changing about what it means to be a leader in the new digital economy. In his book Evolving Digital Leadership, James Brett outlines what you need to do to be an effective digital leader and catalyst for change in the digital world. This book provides a framework and a set of tools to help you develop a deep awareness of yourself and your team to better guide the direction of your company as a whole. Check this out, especially if you are leader who is leading a technical team or you’re looking to make an impact on tomorrow’s digital economy. There are many options out there when it comes to your business strategy. Pick up one of these books and you’re sure to get some helpful guidance while navigating the uncertainty of today’s disruptive world. If you’d like to learn more about ways you can help shape your business strategy online, check out our best practice library at upBOARD.